I've been on a snowman kick lately. 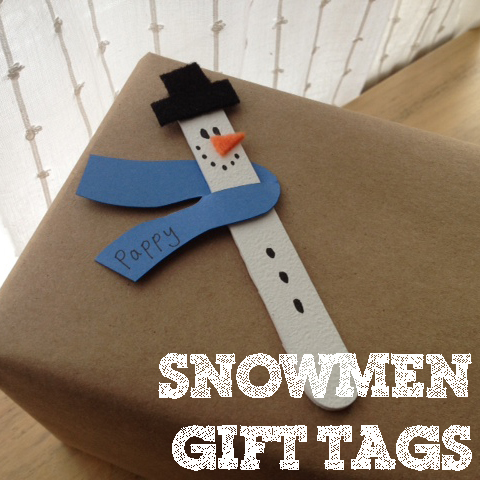 I started with these fingerprint gift tags and have now moved onto other little popsicle stick snowmen gift tags. They were fun and EASY to make...which seems to be my theme this year for Christmas. I started by painting some popsicle sticks white. When they were dry, I painted on eyes, a mouth and some little buttons. I then added a felt hat and a little felt carrot nose. To make the scarf, I used a small amount of colored paper and cut out small scarf-like shapes. Using an exacto knife, I cut a slit in the scarf so I could slide it right onto the popsicle stick. What a fabulous idea! If you add a little ribbon or string to the top...they could double as ornaments as well. Thanks so much for sharing! So cute! Thanks for linking up at Fall Into the Holidays! Next round will open Saturday morning!